This review of the Rogue FKT IIs has taken me a good long while to get out as, what with various health issues this year, it’s taken me some time to give these a good testing and I wanted it to be a thorough review but I am delighted to say the time has come at last! Firstly, I just want to put out there – what a cool name! Rogue F.K.T II (fastest known time). 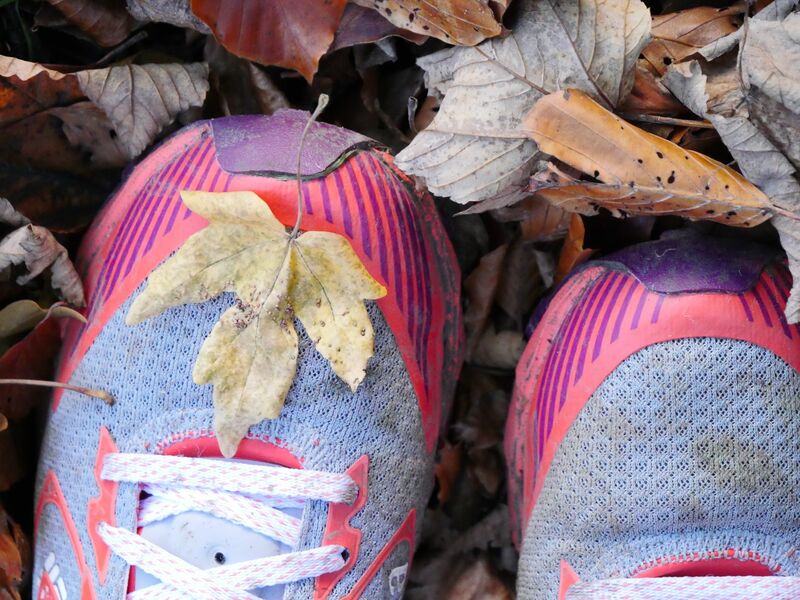 You immediately know these shoes are made for some serious running. 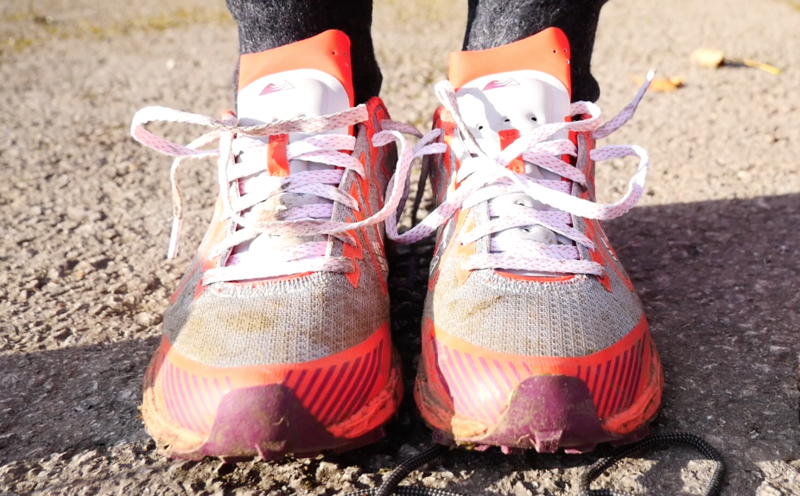 The first thing I noticed about these shoes when I pulled them on was just how comfortable they were – are – they’re my shoe of choice at the moment whenever I venture out for a run with the dog. I live in the middle of a city (albeit, one of the smallest in the UK) but this means there’s a mixture of road and trail work so I needed a shoe that can cope well with both. 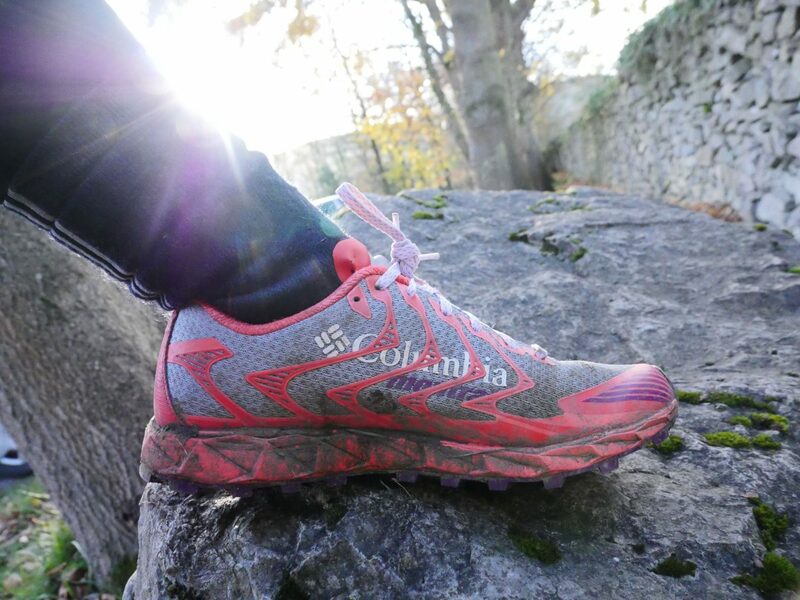 The soft (yet firm) sole has been a little bit dreamy to run on and very kind to my groaning legs and knees. An 8mm drop is midrange and provides me with a comfortable ride both on and off road. Finding out how much of a drop suits you takes some time and I’ve figured out that I like a little bit of cushion underneath. The lugs are 4.5mm deep and quite evenly spaced. They’re wide flat lugs which means that the shoes can cope with being on road. My favourite shoes I’ve ever tested while I was on Trail Running Mag were the Inov8 Rocklites but these do not perform well on road and I feel a little unstable in them unless I’m in mud. 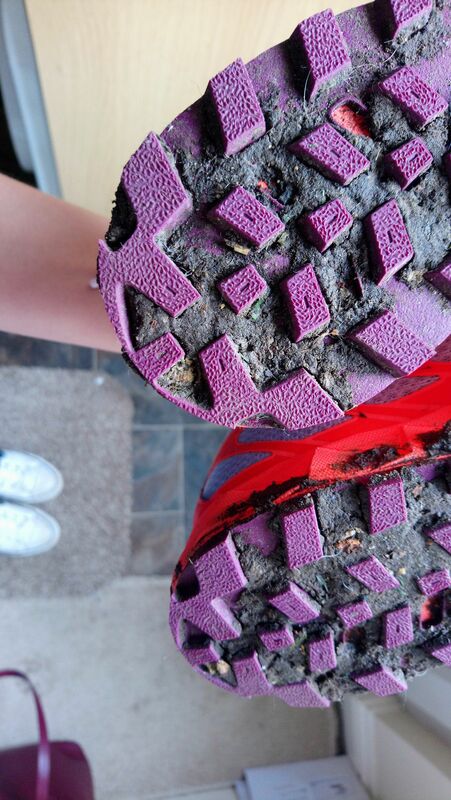 However, I do still find that mud seems to clog a little in them. I don’t know whether that’s because the mud around here is particularly clay-like… That said, when dried it falls out with a good stamp. 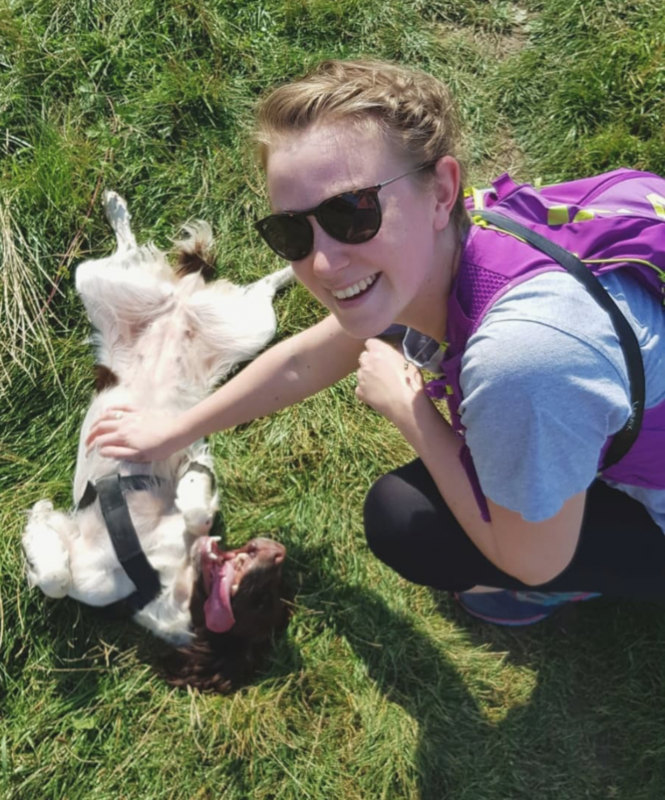 For me, they’ve got the balance right between having the cushioning underfoot, a comfortable and padded tongue, plenty of support around the ankle (which is nice and cushioned), whilst being super light and flexible around my foot. Another important point is that they feel nippy while I’m wearing them. There are some trainers I’ve worn that make me feel a little clumsy but these really give you some movement! 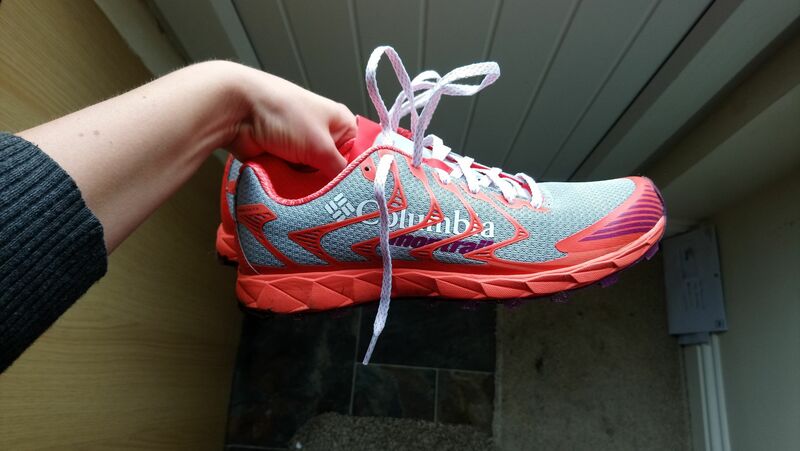 This pair were kindly supplied for testing but I would 100% buy them again as, like previously mentioned, I love the support they give my feet and the balance between the cushioning and how light the upper shoe is. They suit my needs down to the muddy ground. They’re on sale at the moment (at time of writing) so go-go-go!